CONGRATS to our dear friend, Noelle Clark on the release of Honor’s Promise, book two in the Robinhill Farm series. Loyalty and love define Liam. But will obligations to family and farm get in the way of him finding true happiness? Loyalty is high on Liam Cullen’s agenda, but lately he’s been feeling restless. He wants to run away from the endless routines of life on the family farm. He contemplates busting free of the sometimes suffocating confines of the close-knit family. He’d like to see the world. Maybe meet a few girls. 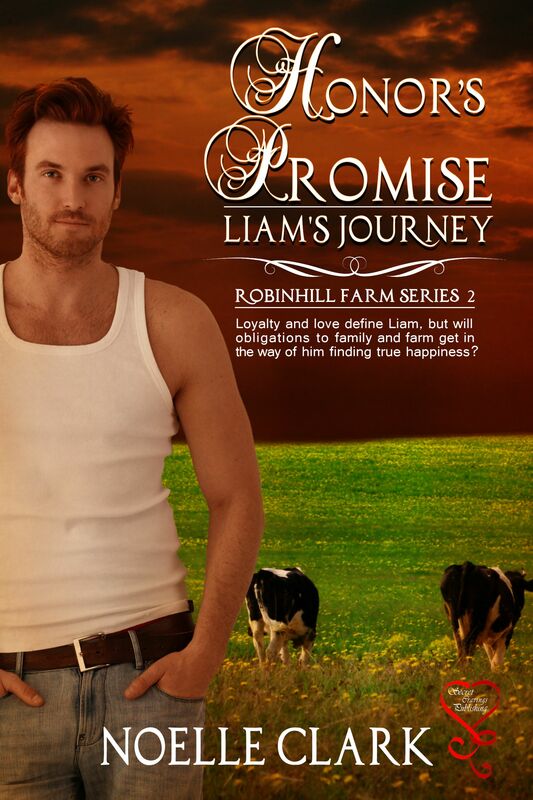 Riddled with guilt that he could even consider such a thing, the final blow comes when Liam’s abilities as a first rate farmer are questioned. He sees red and his quick temper is sorely stretched. He struggles inner demons and attempts to fight the inevitable – until he meets the girl with the blue-green eyes and the copper-colored hair. Without knowing it, Aislin O’Neill sweeps Liam off his feet, and transports him to a place he’s only ever dreamed of. It’s soon apparent that Aislin has her own inner battles. Will she break her self-imposed vow to never get involved with anyone again? Congratulations to Noelle Clark for the release of “Honor’s Promise”.